ST. GEORGE – Smoke began to blanket a neighborhood in downtown St. George Saturday night while multiple fire crews arrived at the scene of a structure fire. The smell of smoke permeated the area around 300 South and 500 East where a home being remodeled caught fire. 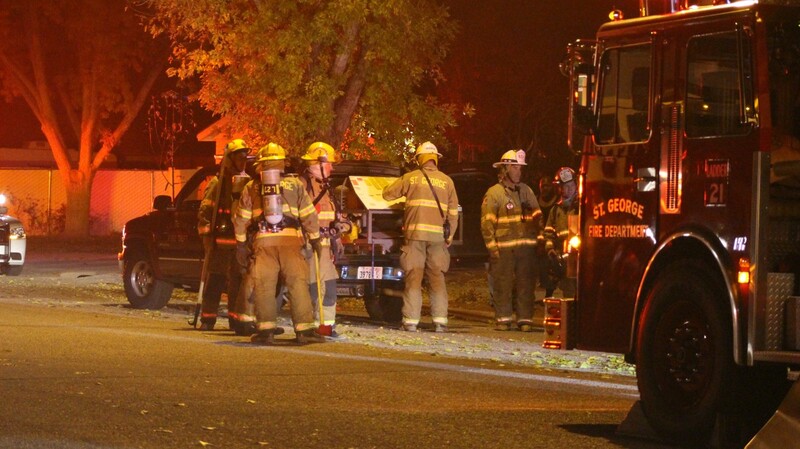 Fire crews were dispatched around 10 p.m. When they arrived at the scene, St. George Fire Chief Robert Stoker said, they saw smoke coming out of the attic, from under the eaves and from the interior of a two-story brick home. Firefighters also saw a heavy amount of smoke coming out of the chimney, leading them to believe a chimney fire had ignited. “It appears they had a possible chimney fire that spread into the confined and concealed spaces around the chimney,” Stoker said. Chimney fires can be ignited if the chimney isn’t cleaned or a routine basis or when there is a breach somewhere in the masonry or piping, Stoker said. The home is older, he said, and though remodeling is taking place inside the home, the chimney appears to be the source of the fire. The chimney is located in the middle of the home and a small fire was still burning in the fireplace when fire crews arrived. The family evacuated the home before fire crews arrived and were unharmed. “So we had a fire that went up through the chimney (and) up through the wall and into the (second story) floor and into the attic and roof assembly,” the fire chief said. 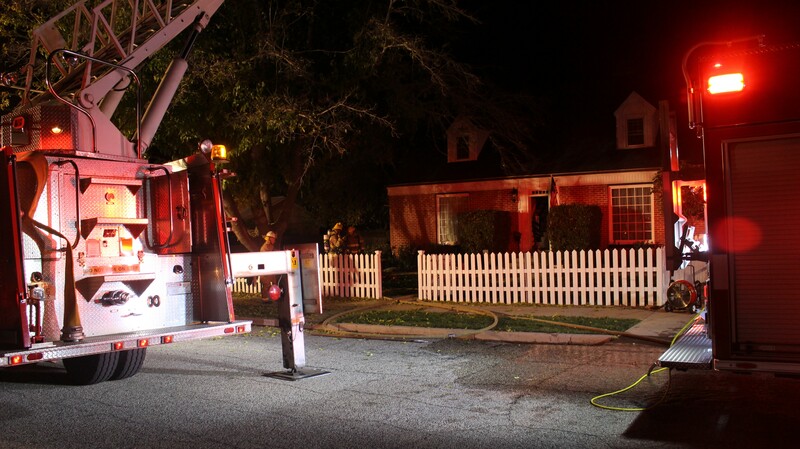 Multiple crews were sent in and rotated through the home to investigate and determine where the fire had spread. On the second floor one of the crews removed wooden floor boards and found a fire burning near the chimney. Another crew dealt with a second fire in the attic where the fire had spread into the roof. A third crew was also sent into the garage to determine if the fire had spread to that section of the home due to the large amount of smoke coming from inside. The origin of the smoke turned out to be from one of the other fires, Stoker said. 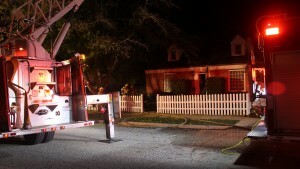 The fires inside the home were subsequently extinguished and mop up began. 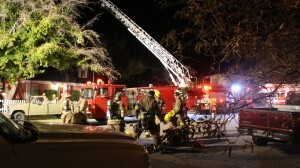 Resources and personnel committed to the fire began to be let go after 11 p.m.
Due to damage done to electrical wiring in the home by the fire, the Fire Department called the city’s Energy Services Department to send someone to shut off the power and remove the meter for the time being. 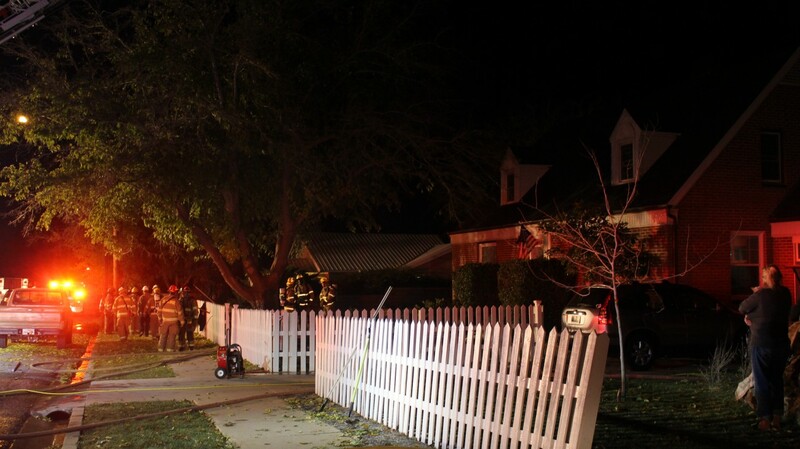 Combined with structural damage done to the area around the chimney and surrounding areas, the home’s occupants were not able to stay in the home for the night. Unable to return home, the homeowners were able to make arrangements to stay with family, Stoker said. Damage to the home is estimated to be around $8,000 to $10,000. A total of four fire engines, two ladder trucks and one engine from Washington City Fire Department were dispatched to the fire on 500 East. The reason for the large response was due to the unknowns involved with the fire at the time. While crews worked to douse the fires inside, other crews rotated in and out of the home as needed. A rapid response team was placed on standby ready to move into the home should a firefighter need to be extracted due to injury. 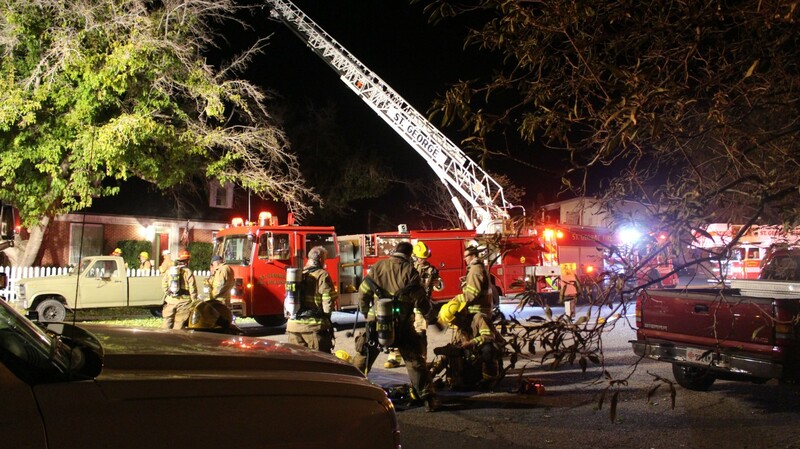 “It takes a lot of staffing … to support a structure fire,” Stoker said. Around the same time the fire at 500 East was called in, another possible fire was called in at the Grandview Mobile Home Park at 435 E. 900 South in St. George. This caused the Fire Department to send out a general page for available units. The incident at the mobile home park involved the main electrical line feeding power to park residents and was resolved by personnel from the St. George Energy Services Department, Stoker said. Every home MUST have a FIREMASK. The FIREMASK is an anti-smoke mask that will allow you to breathe for 60 minutes in smoke. You can find them on AMAZON. Stay safe and smoke free ! !